I’ve never had a journalist bring art supplies to an interview, but when Adrienne Breaux interviewed me in October for a forthcoming piece in Uppercase Magazine, she brought some chalk along and let me doodle while we talked. Hope it starts a trend. This morning to warm up I drew some entries from one of my favorite Tumblrs, Screenshots of Despair. Designed by Kyle Fletcher of Mutual Midwest and screen printed by our friends at the one and only Wire&Twine, this 5-color design features every illustration in Ed Emberley’s classic drawing book, “Make a World”. From dump truck to schooner, from forklift to dinosaur, every image is on the shirt. Go here and buy one to support the production of the upcoming documentary, Ed Emberley’s Make A World: The Film. 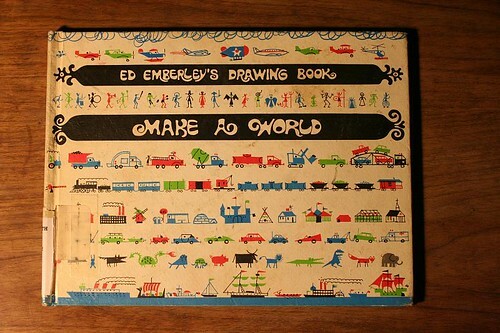 I only came to Ed Emberley’s Ed Emberley’s Drawing Book: Make A World last year, but it’s quickly become the #1 book I recommend to people I meet who say, “I can’t draw.” In it, Ed Emberley shows you how to “make a world” with just a few simple shapes, step-by-step. I love the emphasis on simplicity: if you can draw a triangle, a square, a circle, and a line, you’re good to go. 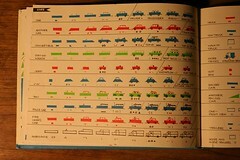 And yeah, I have sat down with the book and copied all the exercises! 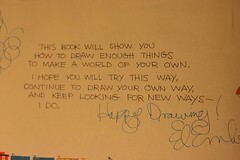 See more of my posts about Ed Emberley. Shot this little video at lunch on my Iphone and posted it to Twitter. I came up with the little exercise for my Vizthink Viznotes webinar. Folks seemed to dig it, so I’m posting it here. The Iphone continues to inspire me with possibilities. Ideas spread to a thousand people…instantly. The best part of all? It can be quick and dirty. People forgive quality. Heck, they’re probably watching the thing on their phone…so why not shoot it on your phone? After years of working at a newspaper, my uncle Jeff quit his job to follow his true passion: preaching. My aunt Connie commissioned me to draw him an image of a tree with strong roots for his 50th birthday. This kind of assignment is rough for me, because I’m not a fine artist. For the kind of drawing and cartooning I practice, drawing isn’t just a drawing, it’s more like picture-writing. 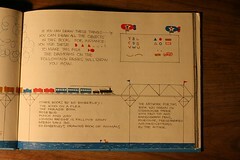 It’s about writing with symbols…either conveying some kind of information or telling a story. I almost drove myself crazy trying to get it to look recognizable. Don’t try to be clever. Just draw. I threw the cross idea out the window, and went with what I love to do: tell a story in a series of simple pictures. A couple of days later, I learned another valuable lesson: Do some research. A tree is a slow explosion of a seed….When drawing a tree, always remember that every branch is more slender than the one that came before. Also note that the trunk splits into two branches, then those branches split in two, then those in two, and so on, and so on, until you have a full tree, be it straight, squiggly, curved up, curved down, or bent sideways by the wind. For this second batch of tea bag doodles, I merged a little activity I stole from Dave Gray via Bill Keaggy with another activity I stole from Matt Madden’s blog. Like I said before: nothing serious, just a fun way to pass a couple minutes and find some ideas. I switched from coffee to tea at work, so every morning I take an index card and set my tea bag down on it, letting the card soak up the tea. 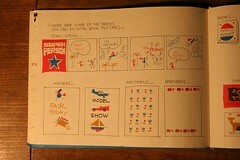 Then, I shop for images on the card, and riff off those with some doodles and captions. Nothing serious, just fun way to pass a couple minutes and find some ideas. You could probably do it with coffee rings, too. They’d be like little ensos. 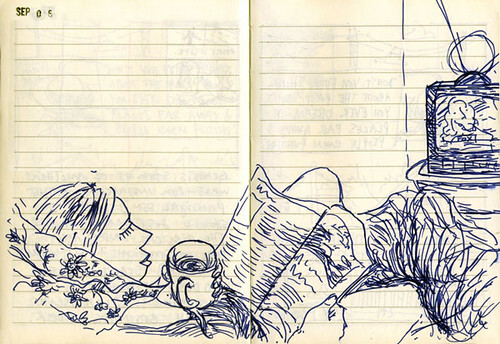 Related: Christoph Niemann’s coffee-on-napkin drawings.